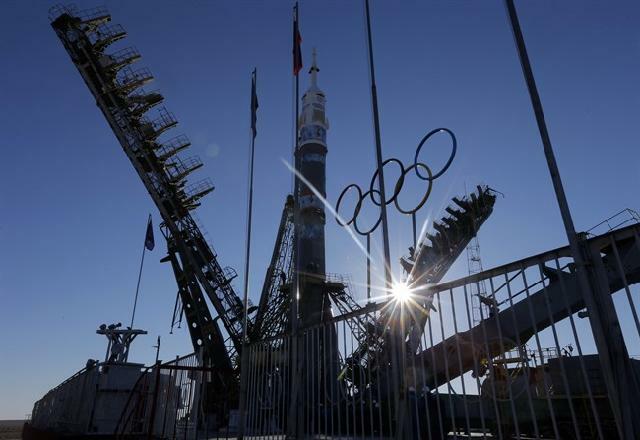 Russia has sent the Olympic torch into space ahead of the Sochi Winter Games. A Soyuz rocket is delivering the torch to the International Space Station- as part of efforts to showcase next year’s games in Russia. On Saturday, two Russian cosmonauts will take it on a historic first spacewalk. The torch will not be lit. The Soyuz rocket blasted off at 04:14:25 GMT from the Baikonur cosmodrome in Kazakhstan. Three cosmonauts – Russia’s Mikhail Tyurin, American Rick Mastracchio and Koici Wakata from Japan – are taking the torch to the ISS, which it is due to reach in six hours. The Olympic torch will be handed over to fellow cosmonauts Oleg Kotov and Sergei Ryazansky, who are already on the orbiting station, when they go on the spacewalk on Saturday. “Our goal here is to make it look spectacular,” Oleg Kotov said earlier. The Olympic torch has been carried into space twice before – in 1996 and 2000 – but it has never left a spaceship. The Sochi torch will then be returned to earth and used to light the Olympic cauldron in February 2014. It is all part of the elaborate preparations for Russia’s first Olympics since the Soviet era. It is also the most expensive one so far, costing around $50 billion (1,620 billion roubles).